Aloe variegata (Partridge Breast Aloe, Tiger Aloe) This smaller aloe grows to 10 to 12 inches tall to 9 inches wide and forms rosettes, sometimes solitary but often clustered, with leaves arranged in 3 ranks that are upright with a boat-hull shape (lanceolata-deltoid) that have a distinct gutter down the middle. 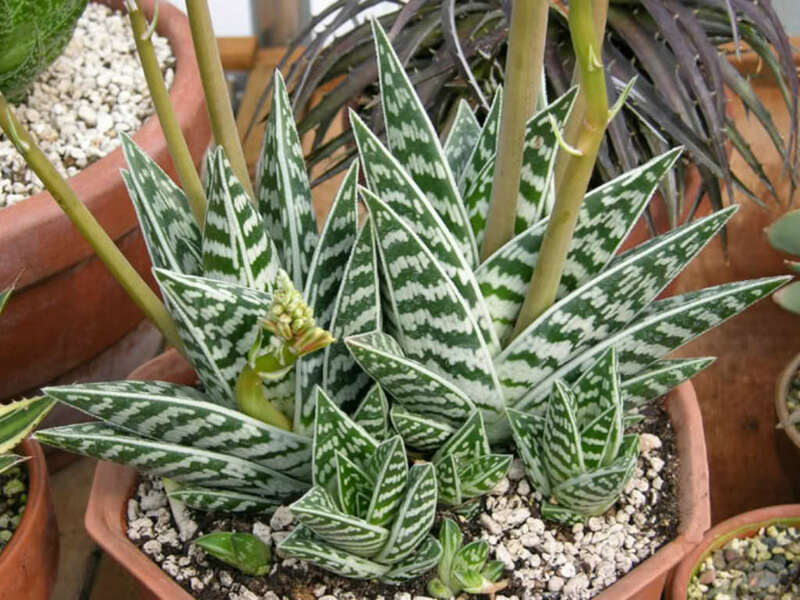 The leaf margins have tiny blunt white teeth along the entire length and are a white color that stands out well against the dark green color of the leaf, which also has short longitudinally-arranged white spots on upper and lower surfaces that often line up in horizontal bands, giving this plant the common name of Tiger Aloe. The spots are also said to resemble those on a partridge breast, which gives this plant its most used common name. The plant will get red highlights that turn the deep green to a more brown color when the plant is drought stressed. The pink to pale red flowers appear on short, stout, and sometimes branched inflorescences. In the wild, flowering for this plant is noted as responding to rains and in Southern California most find that it flowers in mid-winter. Plant in full coastal sun to shade in a very well-drained soil and irrigate little to occasionally. One cannot underwater this plant but many a grower (us included) will note that this plant can rot out at its base if over irrigated or if soil is not well draining; this being said, others say that they can irrigate with impunity without any problems. It is hardy to around 20 F. This aloe is found naturally throughout arid or semi-arid regions of South Africa and in southern Namibia, often in the shade of shrubs or rock crevices. It was first found near Copperberg in the Springbok District of the Northern Cape by the Simon Van Der Stel expedition in 1685 and has since had a long history of cultivation. It is not an uncommon plant in California and because of its hardiness and willingness to grow indoors, is considered the most popular aloe grown in Europe and England where it is often grown as an indoor flowering plant through the winter months.